Welcome to the first new post on my new website! I got most of the pieces put back together, and will finish the Recipes page soon. Do you like the new Food & Drink theme? (I hope so–the old one isn’t available anymore.) I think it works like the old site, but if it doesn’t, do get in touch at heatcagekitchen@gmail.com. Ditto if there are any topics you’d like me to cover here, or you can’t find. Now. . .on with it. Now, let me remind you that I know how to get free coffee from Starbucks. . .here’s how I did it: I purchased a Venti (“large”) Molten Chocolate Latte, as planned, and enjoyed every hot, chocolaty sip. (This was the expensive cup, about $5. But wait, there’s more.) Then asked for a refill with plain brewed decaf. Then, as with the first one, I used the Starbucks App to pay for it. And my Venti rang up $0.00. Five times. No kidding. I really did drink that much decaf coffee on a Sunday afternoon, reading two books. Just what you need to make your #StarbucksDate complete for social media! Oh, and the Starbucks on my street will soon be serving the Evenings Menu. Still haven’t tried it, don’t know when I will. Never think about going there for dinner, you know? But that place is still busy nearly all the time. And I think that’s where I got my lovely bronchitis–I started needing naps the next day, had sugar cravings and nearly every day last week, except one–the day Neighbor E and I went shopping at the new HEB. (I was standing up and walking a lot, so it kept me awake.) Let me tell you all about this place! I probably have mentioned this on the blog before, but I’ll mention it again. My Grandmother O’Donnell used to take me grocery shopping when I was a little bitty kitty. We would head to Schweggmann’s early on Saturday morning and. . .shop for groceries. No kidding. To a pre-teen girl in those days, it was great fun–because my mother did not want to take *anyone* grocery shopping. (It was likely her only “alone” time.) Maw Maw taught me grocery shopping at an early age, and, unlike many folks, I’ve enjoyed it ever since. Now do you understand my affinity for Suzy Homemaker toys? Longer view of the store from one side. 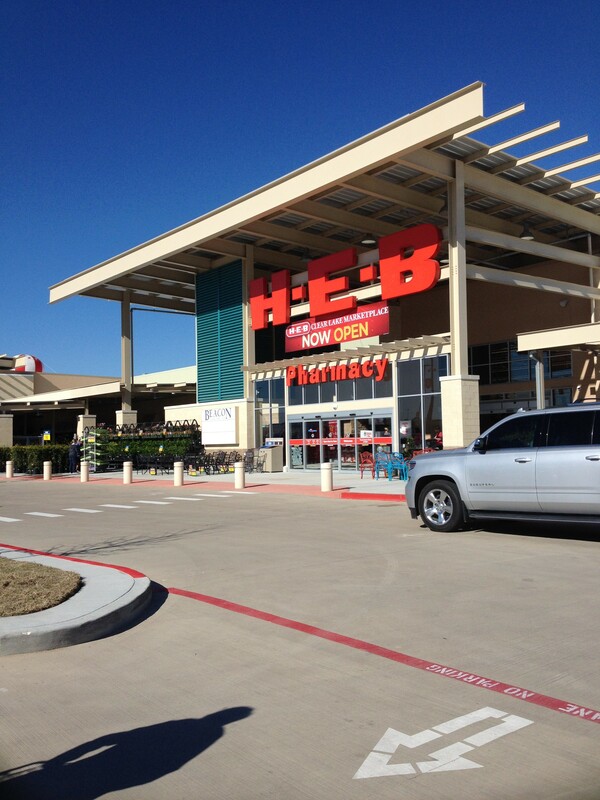 The store itself is now open, with more and more of what HEB has. Unfortunately, I didn’t take enough pictures. We’re still scratching our heads at this one. But that’s OK.
Once inside, we were treated to a coupon for a $25 gift card for bringing a new prescription to the pharmacy, or transferring one. (This came in handy when I was sick last week, and I haven’t used the gift card yet.) We went in on the pharmacy side and worked our way around to the other side. We were treated to samples of health care products, including three from Dallas-based MopTop Natural Hair Care, which is being sold exclusively in HEB stores. I haven’t tried the samples yet, but I was supplied with an instruction sheet. I’m particularly interested in the Curly Hair Custard, since my hair will curl in the most unflattering and unnatural ways at the mere hint of humidity, no matter how much I straighten it with the hair dryer. Both Neighbor E and I had things to get (including cream cheese for an upcoming recipe test), so we just wandered around hither and yon, sampling where they were offering food and finding new stuff. E also found his favorite Vanilla Chai, less expensive than Target, as well as some FreshPet things for his sweet little Chihuahua, Speedy. We found a number of new things, and, well, literally ate our way through the store, really. We tried cheeses, pesto, chicken, fresh juice, samples of HEB’s ready-to-cook meals, and I can’t remember what else. Everything was delicious, of course, and when I went back on Friday to get my prescription filled, I also had ice cream! From the cheese department, I introduced E to Manchego Cheese, which he’d never had before. He’s now a fan. I explained Roasted Sage Turkey Thighs to one lady while looking for more turkey thighs in the meat case. Neighbor E also noticed something I didn’t: the aisles are wider than most of the other stores we’ve been in. Definitely an improvement. On the other side of the store lies the bakery, meat and fish areas, (including a sushi case with fresh samples) and a huge produce department that has not only a lot more product, but freshly squeezed juices as well. We were able to sample some of them, and one had raspberries in it. YUM. This HEB also has fresh lemonade, orange juice, apple juice, carrot juice and a few others I don’t remember–all freshly made daily, in neat little bottles. In addition to the apples, oranges and other fruits we were sampling. Well, after we saw everything and sampled everything, and got what we needed to purchase, we headed out. . .or so we thought. The new tomato and basil plants from HEB, a week later. I’ll plant them soon. Easy and convenient, and right where you can find it. The new Clear Lake Marketplace is 100,000 square feet of nearly every kind of grocery shopping you can think of, and is open daily from 6:00 am to 12:00 pm. In addition to a pharmacy, there is a much larger Healthy Living section, as well as catering and wedding services (just for cakes and flowers.) There isn’t yet a Redi-Clinic, but there should be within a year. When I realized I was sick and needed to get treated, I drove to the Friendswood store to see a PA, then to this HEB to fill the prescription. And with the 100F temperature I was carrying around, I didn’t enjoy the walking the place like I did the day we went! I also discovered that this pharmacy offers compounding services–just like the ones I use in The Woodlands for my hormones. However, they don’t compound on site, they send it to a lab. But more and more pharmacies are offering compounding–why? Because we’re asking for it. This pharmacy also offers pet medications. That’s new, too. This new HEB is not your grandmother’s grocery shopping. And I still wish I could take her to this grocery, as well as Central Market. But I hope she’s with me in spirit when I’m shopping. This is my first time on your blog. I like your writing style. I’m reminded of a comment you made on my page. We’ll have to get together and talk. Thanks for stopping by, George!